Boneless pork tenderloin is a cut with excellent yield, making it a cost-effective center-of-the-plate choice. Chef Sailsbery wraps the meat in pancetta to seal in the juices during cooking, then serves the pork with tart apricots and pomegranates for contrast. A side of polenta completes the hearty seasonal dish. Preheat oven to 325 F. In mixing bowl, combine dried apricots, brandy, mustard and 2 tbsp. herbes de Provence. Set mixture aside. Remove silver skin and excess fat from both tenderloins. In small bowl, combine seasoning salt, chopped rosemary, 2 tbsp. herbes de Provence and cinnamon; stir in brown sugar. Apply mixture liberally to both tenderloins. Wrap each tenderloin with pancetta (may be necessary to tie pancetta around pork with cotton twine). Set aside. Place large sauté pan over high heat; add oil. Sear both tenderloins in hot oil 3 to 4 min. on each side. Place tenderloins in 9 x 13 in.baking pan. Place in oven; bake 15 to 20 min. or until temperature in center of the thickest portion reaches 145 F.
Meanwhile, place sauté pan with drippings over med. heat. Add apricot mixture and additional oil, if needed. Stir until caramelized; remove and keep warm. In another sauté pan over med.-low heat, combine chopped shallots and garlic. Cook until mixture starts to brown. Add pomegranate seed puree or juice and remaining ingredients. Simmer until mixture reduces by half. Remove tenderloin from oven, let rest 5 to 8 min. Slice into 1/4-in. thick pieces. 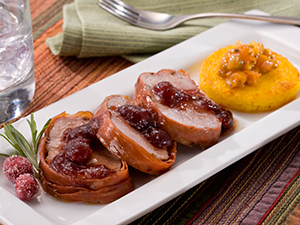 Plate tenderloin, top with pomegranate sauce and apricots. Serve with polenta.